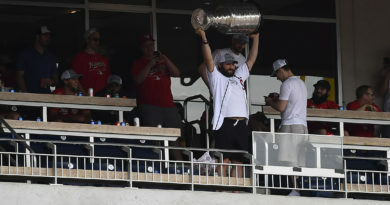 Fans showered caps onto the ice Wednesday night for Alex Ovechkin’s hat trick during the Washington Capitals’ 4-3 win against the St. Louis Blues. Washington’s captain broke the 0-0 tie with a power-play goal in the game’s 18th minute. The top-shelf shot gave the Capitals their fourth power-play goal in as many games. Ovechkin delivered again 10:12 into the second period. He scored his second of three goals on a one-timer from the left faceoff circle. The forward completed the hat trick in the 7th minute of the third period with a break-away goal. Ovechkin swiped the puck in Washington’s defensive zone and completed the break himself. The goal was unassisted. 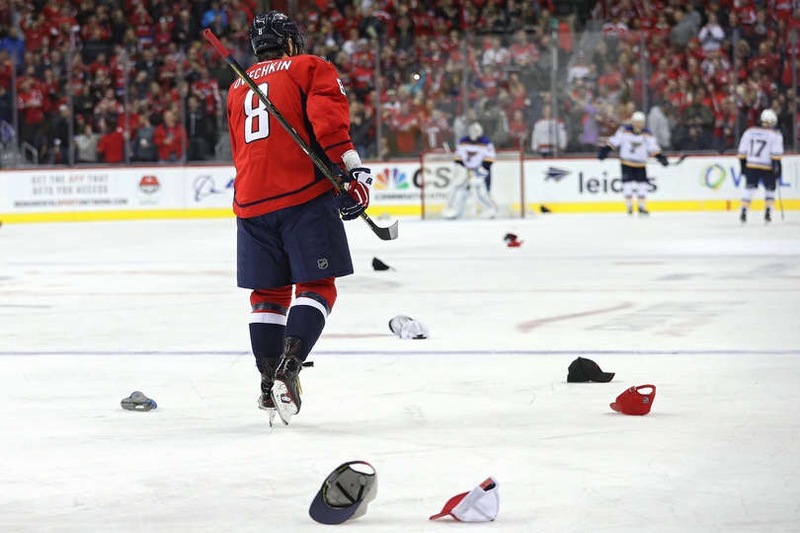 Ovechkin also scored a hat trick in his last outing against the Blues. He now has 13 goals in 14 career games against St. Louis. Kuznetsov has disappeared from the offense this year. In the 2015-2016 season, Kuznetsov led the Capitals in points and assists. However, Kuznetsov’s year has been nothing like his last. He entered the night seventh on the team in points and fifth in assists. Kuznetsov came alive netting his third goal and sixth assist of the season. Washington and St. Louis had 11 penalties combined. Six of these came in the first period. Shutdown defense was absent in critical times for both teams, as they each surrendered a power play-goal and allowed two scores in the third period. The Capitals’ defense collapsed late in the game. With 1:16 left in regulation, Washington led 4-1. Over the next minute and 44 seconds, the Capitals let up two goals and came close to allowing a shot at the equalizer. Blues defenseman Alex Pietrangelo and forward Vladimir Tarasenko scored the goals in the game’s final two minutes. Tarasenko also scored in the 11th minute of the second period. “[Tarasenko is] a dangerous guy out there,” Ovechkin told CSN. 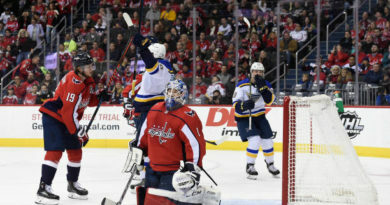 Before the Blues’ late onslaught, Washington goalie Braden Holtby had saved 11 of 12 St. Louis shots on goal. During those final minutes, Holtby saved seven of nine Blues shots. He ended the night saving 18 of 21 overall. Holtby’s counterpart, Blues goalie Carter Hutton, saved 21 of the Capitals’ 25 shots. Washington forward Lars Eller played more than 14 minutes Wednesday. He missed the Capitals’ game Sunday after leaving Friday’s contest with an injury. Washington forward T.J. Oshie left the same game with an upper-body injury. However, Oshie is week-to-week and has no time frame for his return. 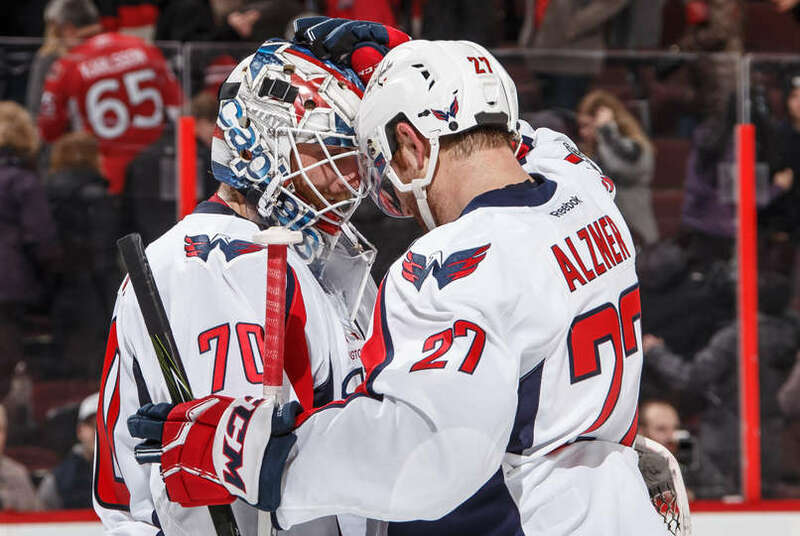 The win brought the Capitals to 12-5-2. Washington remains in third place in the Metropolitan Division, trailing the Pittsburgh Penguins by one point. The Blues slid to 11-7-3. St. Louis maintains its second place spot in the Central Division. The Capitals host the Buffalo Sabres Friday evening, concluding their five-game home stand. The Blues will start their own five-game home stint when they host the Minnesota Wild Saturday night.